Anyway, onto the news at hand. 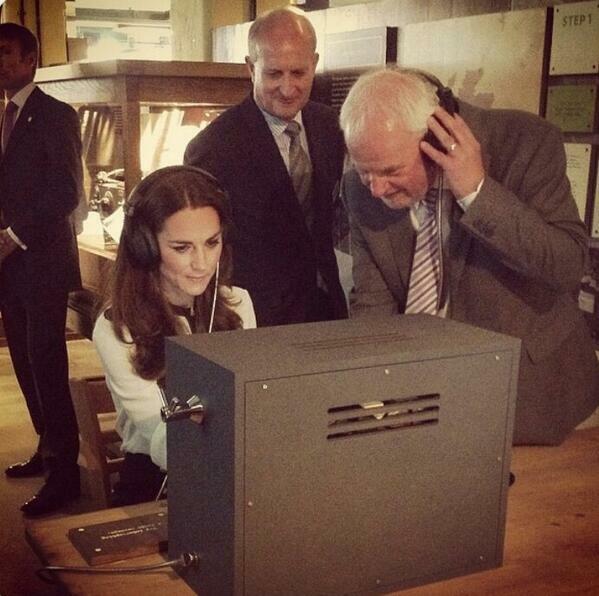 Kate paid a visit to Bletchley Park yesterday (June 18), where coincidentally her paternal grandmother used to work. Her name was Valerie Glassborow, later Middleton after she married Peter (Michael Middleton’s father). 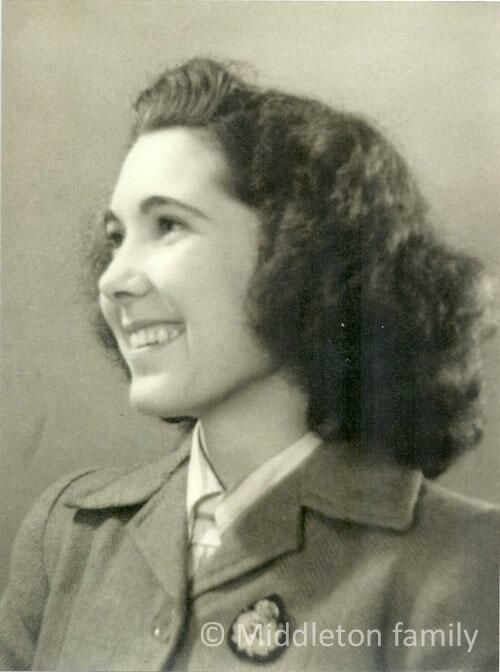 She was reportedly a duty officer at Britain’s Government Code and Cypher School at Bletchley Park during World War II. Below is a photo of Valerie circa… WWII? Clarence House (who released the photo) didn’t say, but it’s obviously from when she was a young woman. Kate was officially at Bletchley Park to rededicate it following a year-long £8 million restoration program to restore the Park to its original WWII look. Kate toured the site, played with a Morse Code machine, and planted a tree. I don’t know why they plant so many trees, but the royals seem to plant trees a lot. Of course, they don’t actually “plant” them, they just throw some dirt onto an already planted tree. But sure, call it “planting”. Kate also met a woman who worked with Valerie, Lady Marion Body, 90. Kate said (minus some ums, buts, honestlys, and actuallys), “What an incredible story that you shared your time here with my grandmother. It’s so moving for me, and to be here as well. I was aware of it when I was a young girl and I often asked granny about it but she was very quiet and never said anything.” Go here for a great video of Kate speaking. They won’t let me embed the video or else I would. For the trip to Bletchley Park, Kate repeated an outfit from 2011. It’s the navy skirt with gold buttons and slits, and Sgt. Pepper white and navy blouse (with buttons) from Alexander McQueen. I guess it has a military-ish feel, which is kind of a literal sartorial interpretation since she was visiting a war-time building, but I’m not a huge fan of this outfit. I didn’t like it the first time either. She has another McQueen coat that has a military feel that she could have worn, which I would have much preferred. I friggin love this coat. Kate accessorized with her Stuart Weitzman navy suede clutch, navy suede heels, and sapphire and diamond earrings. PS. 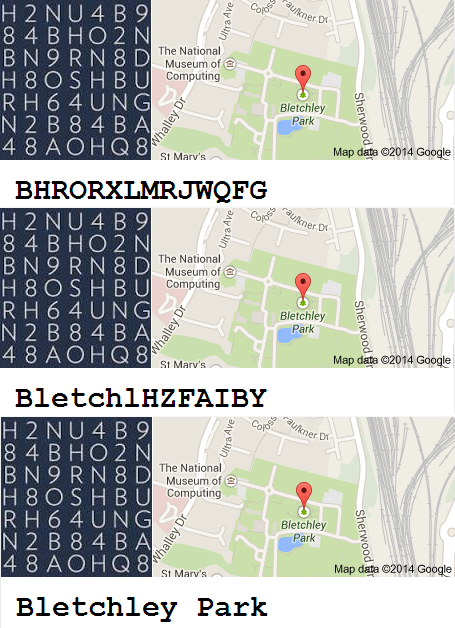 Everyone should go Google “Bletchley Park”. Something really cool happens when you do. I’m tagging this bit of news onto my post. I was just finishing up my post when this stuff was released. Kate has made a statement in support of Children’s Hospice Week, as Paton of EACH. Kate seems to have made a private visit to the hospital. Kate wore a Diane von Furstenberg pink patterned warp dress she’s had since at least 2002 when she wore it to a party at St. Andrew’s. The military-ish outfit wouldn’t be so bad if a) it wasn’t so badly made. Really, for that price… b) her mannerisms don’t really go well with military style. Forget even hair flickering, she just has bad posture. My mom made me walk with heavy Optics textbook 5 minutes every day until I learned to keep my head and back straight, someone should make her do the same. And… April showers bring May flowers? I’m often surprised at how bad some expensive designer outfits are–not just on Kate, on a lot of celebs. For the price, you’d think it would look better. It really does go to show that they are paying for the name and not the quality of the piece. And yes, Kate’s posture is terrible. I fully expect Kate to go on vacation, Isn’t that what everyone does over the summer?? Why should she be different. I don’t like the outfit at all! Happy to see Kate visit one of her charities without to much media. Good for Kate…. I hope she keeps up the good work!!! Point being, the rest of us (including the other members of the BRF) work to earn that vacation. A handful of events packed together, and a “secret but gee we brought the photographers to promote it” back in April/May, doesn’t earn you the months of vacation time these two take. 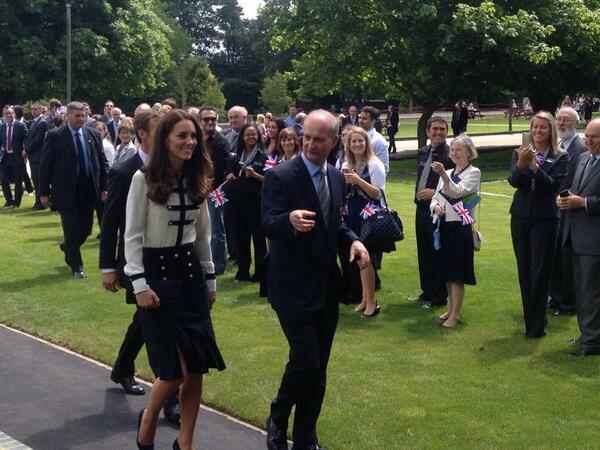 The classic Bill and Kate Middleton PR move, as KMR noted above. Well she IS different. Everyone else has 40-hours-a-week job, and volunteering on top, and no servants, nannies etc. She essentially had a vacation since the beginning of the year, except for 3 weeks in Aus/NZ, and this week. Um, yeah. Vacationing is what working people do. And they pay for it. They do not send the vacation bill to the taxpayers and/or they don’t get vacations given to them for virtually nothing in order to create publicity for a particular venue. Not everyone can afford to a) take time off work to go on a vacation over the summer, and/or b) take a vacation/travel even is they get time off work. So no, not everyone takes a vacation over the summer. I hope Kate keeps up her workload as well. I’d really like them to add more things to her schedule. The girl sure is upping her PR game to try and salvage whatever shreds of credibility she has left after BumGate. I wish her the best, but some people are really their own worst enemy, and I believe Kate and Will fall into this category. Time will tell. I’ve noticed she’s not worn a flimsy skirt/dress since the latest bumgate. I wonder if that will continue. “keep up the good work” r visiting your charity after 6 months, all other appearances are not work related thats why they are called “appearances” , anyway this is what her title and her perks and privileges except her to do, not MIA for weeks, doing what exactly??? She still lazy stat! It’s so disappointing that they think we’re all idiots. I know you’re especially down about them today, Blu. I gave up on them years ago. They’ve just proven they’re in it for themselves and have no concept of reality. Go read a bit about Victoria and Daniel, Felipe and Letizia, Wax and Max. Maybe that will lift your mood. She’s only a doormat for William, but the spine of steel is in there towards everyone else. She’s getting her revenge for the decade of Waity by taking the taxpayers and royal family for all she can. After all, she cannot take it out on William, can she? Demanding the huge KP mansion when at least 3 other KP spaces were available, designer clothes, expensive vacations (with security these jaunts ring in at $100,000s a trip), taxpayer money spent on security upgrades at her parent’s house, moving to Berkshire after PGTips arrived, helicopters instead of trains to engagements, 1 hour gala appearances as their main “charity work,” vacations disguised as royal tours. Every perk, little or no work. They enable the worst in each other. Kate is going in the direction of Marie Antoinette’s excesses. Her misplaced values are disappointing. Whe will the “sheeple” of Britain wake up? Nevertheless, for all the world to see……pathetically out of her depth ….. Hamming up a “princess” – Truth is redeeming justice!